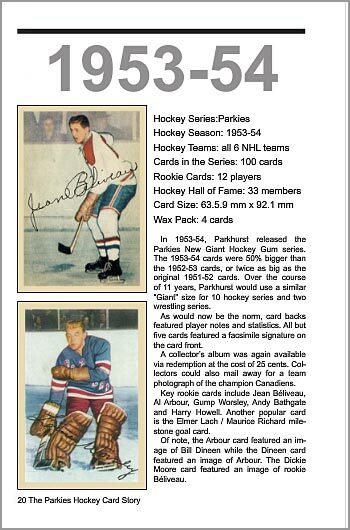 From 1951 to 1964, Parkhurst hockey cards captured the imagination of a generation of hockey fans. 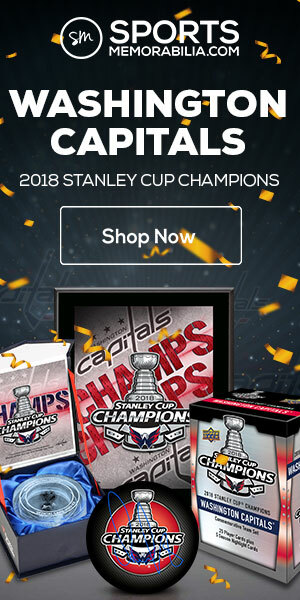 A nickel would get them a piece of gum and some trading cards of their favorite NHL players. For most, this was the only way they could see the players that they read about in the newspapers or heard about on the radio, since TV wasn’t mainstream yet. 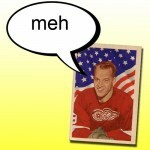 Before 1951, hockey card releases were sporadic, if nonexistent. 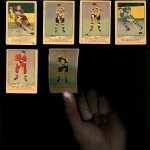 In fact, no hockey cards were released from 1941-42 to 1950-51. 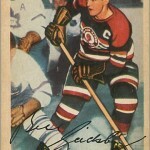 The 1951-52 Parkhurst set is considered the first modern-era set of hockey trading cards. Parkhurst cards became highly prized by card collectors decades later, and are still sought-after today. “The Parkies Hockey Card Story,” while an incomplete work, is a valuable resource for hockey card enthusiasts who want to know more about these vintage collectibles. 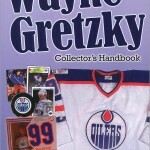 “The Parkies Hockey Card Story” was written by Richard Scott, former editor of Canadian Sportscard Collector and later The Want List magazine. 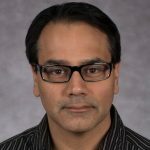 He was also the editor of the “Charlton Standard Catalog of Hockey Cards,” an annual price guide that came out from 1991 to 2006, during the book’s last few years. 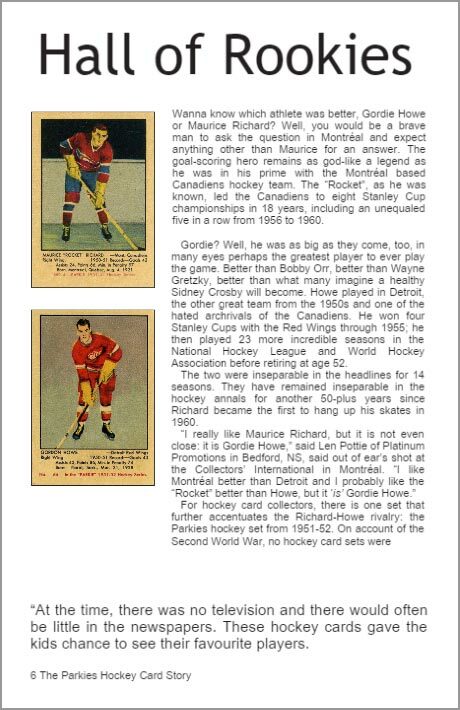 Scott spoke with several vintage card sellers and expert collectors for “The Parkies Hockey Card Story.” He recaps Parkhurst Product’s 12-year run as a hockey card manufacturer in the books opening pages, then entertains the debate of who is better, Gordie Howe or Maurice Richard. Another four pages highlight the toughest-to-find Parkies in high-grade condition. Four more pages detail the last few sets, and why Parkhurst Products stopped making cards. Each set gets a detailed write-up. It is facts like these that you cannot get from a price guide. Unfortunately, the book could use more information like this. The book debates the eternal question: who is better, Gordie Howe or Maurice Richard? That is perhaps the biggest problem with “The Parkies Hockey Card Story.” It leaves you wanting more of that kind of information, as well as more pictures of these vintage works of art. A fair amount of space in the book is filled with information you don’t necessarily need, such as pie charts detailing the percentage of rookie cards in sets released decades before Parkies. Or the average winning percentages of each Original Six team during Parkhurst’s peak years. Instead, wouldn’t that space be better served by showing a picture of the 1963-64 Gordie Howe Parkhurst card — one of the most iconic in Parkie’s 12-year run? Or explaining why Alex Faulkner’s rookie card is the second-most valuable card in the 1963-64 Parkies set at upwards of $150? Or, as long as we are on the topic of the 1963-64 set, why the Detroit and Toronto cards use flags as backdrops, but the Canadiens cards use colored stripes behind their players? How about a picture of some card backs — especially 1955-56, which has two variations: the standard Parkies cards and the green-text Quaker Oates versions. Or some pictures of the wrappers? Or perhaps how the design of Parkies cards in the early 1960s were heavily influenced by the Pop Art movement? 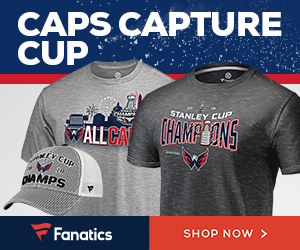 All of these suggestions would have made “The Parkies Hockey Card Story” what it should have been: the be-all, end-all book when it comes to vintage Parkhurst hockey cards. 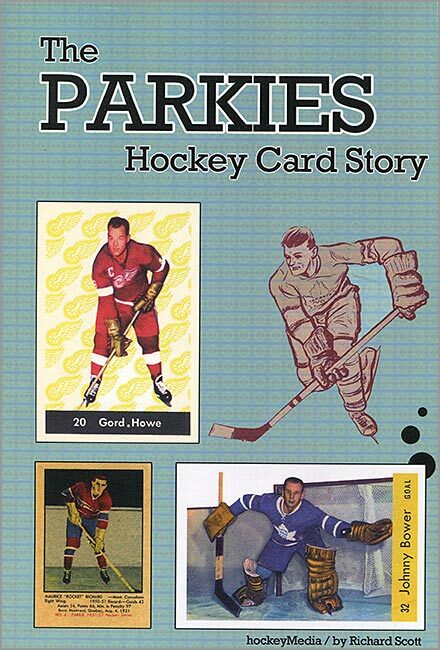 What I like about “The Parkies Hockey Card Story”: Each set has a page-long write-up with interesting facts and details, as well as full-color images of many of the cards…well, in the color version of the book, anyway. You can also purchase a less-expensive, black-and-white version, but that would take the thrill out of seeing images of these cards. There is also an eBook version of the book that is in color and about a third of the price of the color print edition. What I don’t like about “The Parkies Hockey Card Story”: At 40 pages, it is short, and it could have been a lot more in-depth. More pictures would have made a huge difference. The pages about the toughest Parkies to find in high grades seems like a waste, since that information is outdated now and only lists population reports of cards graded by Professional Sports Authenticator (PSA), but not by Beckett Grading Services (BGS). A lot of information from other sources, like early issues of Beckett Hockey Magazine, should have been used to fill in some of the historical gaps in this book.